I remember reading along time ago in a book that "what draws and keeps so many in California is not so much what the state has as what it suggests." When I quoted this to a friend at the time who was a recent transplant from New York to the West Coast, he bristled. There certainly are wonderful things about this remarkable state, but I still think that quote still makes a valid point. In the same way I think this has been the case with Le Figaro Cafe for many years, if not decades. The location and place itself has been a mecca more for what the Village represented than what it has been in recent years. And Le Figaro Cafe was certainly not a window into history of this neighborhood, steeped in bohemian history - once a hangout for Bob Dylan and Beatniks. 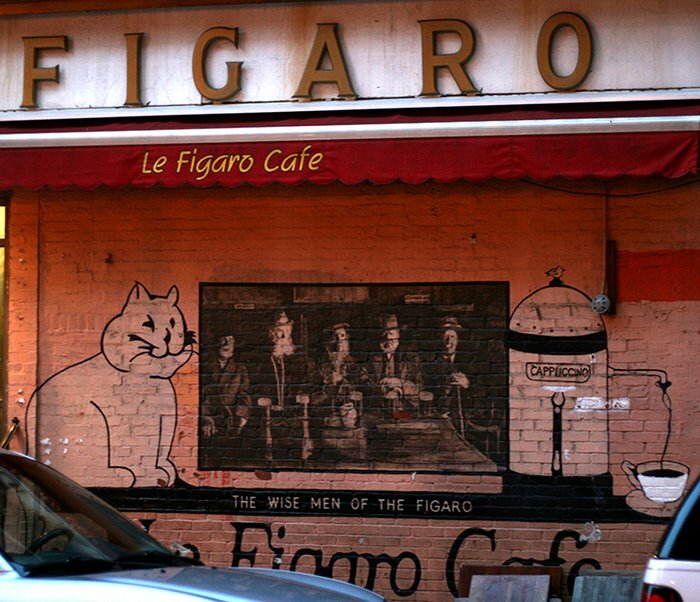 Recently, Le Figaro Cafe at 186 Bleecker, closed shop after over 50 years in business. It was a bittersweet announcement, but for most I think their recent Figaro Cafe experience was more bitter than sweet. Many complained of bad service and mediocre food. The place had basically been a tourist draw for eons. This is not surprising being located at Bleecker and MacDougal Streets.